In this article, you will learn what is Android system recovery, and how to fix Android stuck at system recovery step by step. To get out of Android system recovery more easily, you need this Android repair tool. 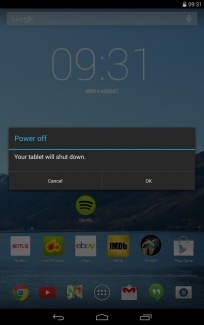 You know your Android device is stuck in recovery mode when you cannot turn on the device. 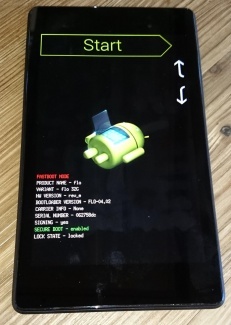 If you try to turn it on it shows a message that says “Android System Recover.” This situation can be quite debilitating for most Android users. Most of the time you don’t know whether you have lost all of your important Android data. It is even more worrying because of the fact that you cannot turn on your device at all especially when you don’t know how to fix it. Part 3. Android Stuck at System Recovery? How to fix in one click? Part 4. Android Stuck at System Recovery? How to fix in the common way? Despite all the worry that surrounds an unwanted Android system recovery screen, it is actually a feature that can be quite helpful to your Android device when it’s needed. It can be useful when you want to hard reset the Android device without having to access the settings. This can be very useful if your device is not working very well or if your touch screen is experiencing problems. It can also be very helpful when you are having problem accessing the settings on your device. For these reasons it is actually a good thing although when it does happen unexpectedly, you may want to know how to fix it. Now that you know how useful the Android System can be, you may want to know how to utilize this feature to get out of some of the problems we mentioned above. 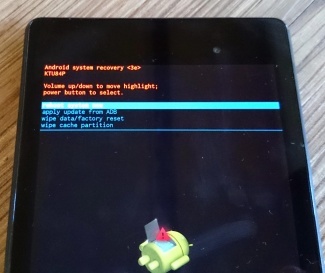 Here’s how you can safely get to Android recovery system on your Android device. Step 1: Hold down the power key and then select “Power Off” from the options on the screen. If however your screen is unresponsive, keep holding the power key for several seconds until the device is completely turned off. Step 2: next, you need to hold down the Power and the Volume Key. You should able to see the Android image and a bunch of information about your device. There should also be a “Start” at the top right corner of the screen. Step 3: Press the Volume up and Volume down keys and use the Power key to select menu options. Press the Volume down Key twice to see “Recovery Mode” in red at the top of the screen. Press the power key to select it. Step 4: The white Google logo will appear immediately followed by the Android logo again as well as the words “No Command” at the bottom of the screen. Step 5: finally, Press and hold both the Power and the Volume up Key for around 3 seconds and then let go of the Volume up Key but keep holding the Power Key. You should see the Android system recovery options at the top of the screen. Use the Volume keys to highlight and the power key to select the one you want. Sometimes during the System Recovery process, the process can glitch, and you’ll lose data on your device, rendering it unusable. However, another solution to fix this is to repair your device using the dr.fone - Repair tool. Note: Be aware that this process can erase all your personal files on your device, so ensure you’ve backed up your Android device before continuing. Step #1 Head over to the dr.fone website and download the software for your Windows computer. Once installed on your computer, open onto the main menu and connect your Android device using the official USB cable. Select the Repair option. Step #2 Select the ‘Android Repair’ option from the next screen. 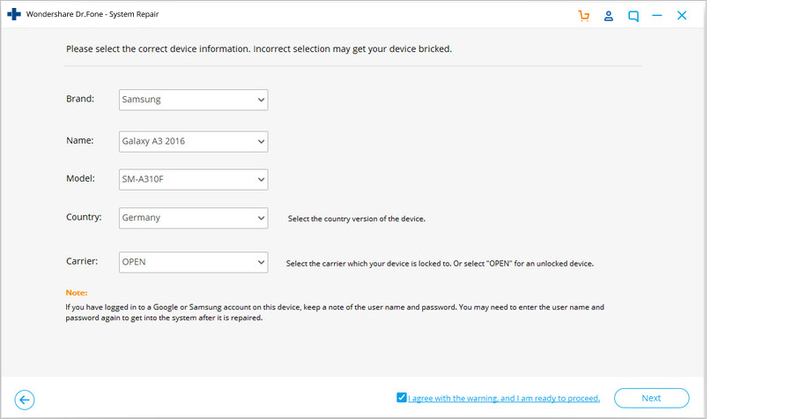 Insert your device information, including the brand, carrier details, model and country and region you’re in to ensure you’re downloading the correct firmware. Type ‘000000’ to confirm the Repair process and authorise the operations that are able to take place. 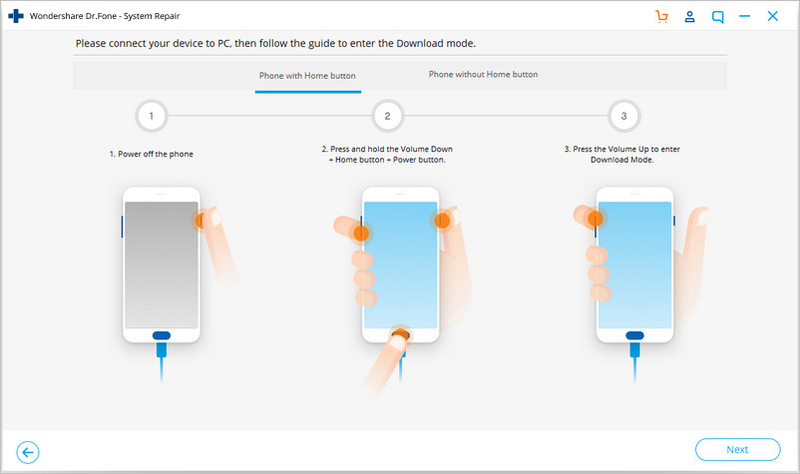 Step #3 Follow the onscreen instructions on how to put your device in Download Mode. Your device should already be in this mode but follow the instructions to make sure. 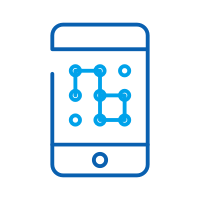 There are methods available for devices both with and without home buttons. Step #4 The firmware will now start downloading. You’ll be able to track this process in the window. 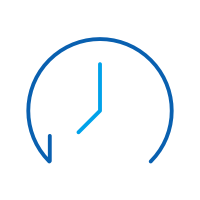 Ensure your device and your computer stays connected the entire time, and make sure your internet connection remains stable. After downloading, the software will automatically start to repair your device by installing the firmware. Again, you can track the progress of this on the screen and you’ll need to ensure your device remains connected throughout. 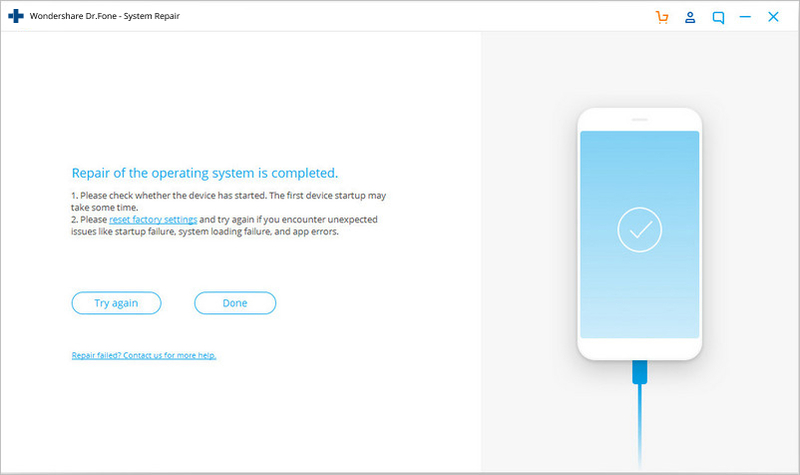 You’ll be notified when the operation is complete and when you’re able to disconnect your phone and use it as normal, free from it being stuck on the Android system recovery screen! If however your device is stuck on system recovery mode, here’s how you can easily get it out of system recovery. The process is slightly different for different Android devices so you should check your device’s manual before attempting this process. Step 2: Press and hold down the Home button, Power Button and the Volume up Key simultaneously until the device vibrates. Step 3: Once you feel the vibration, release the power button but continue to hold down the Hone and Volume up Key. 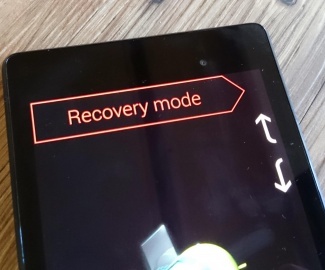 The Android recovery screen will display. Release the Volume up and Home buttons. Step 4: press the Volume down key to select the “Wipe Data/ Factory Reset option and then Press the Power button to select it. Step 5: Next, you need to press the Volume down button to highlight “Delete All User data” and then press the Power button to select it. The device will reset and present the “Reboot System Now” option. Step 6: Finally Press the Power button to reboot phone in normal mode. Losing data on your Android device is a common occurrence and since Android devices don’t really have an automatic full backup solution, it is important to know how to backup and restore your device system. Here’s how to easily do that. Step 1: Enter recovery mode on your Android device as described in Part 2 above. Use the Volume and Power keys to select “Backup & Restore” option on the screen. Step 2: Tap on the backup option or use the Volume and Power keys if your screen is unresponsive. This will begin backing up your system to the SD card. Step 3: after the process is complete, choose "Peboot Reboot" to restart the device. To restore the system from the backup created, follow these simple steps. Step 1: Once again enter recovery mode as described in part 2 above and then choose Backup & Restore from the menu list. Step 3: You will be notified when the system restore is complete. 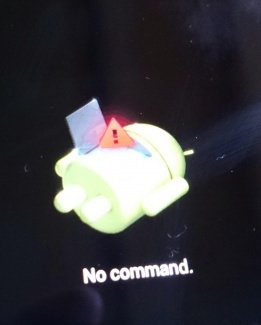 Android system recovery mode can be quite useful especially when your system is unresponsive. As we have also seen it is important to know how to get into and out of System Recovery mode if you are going to backup and restore your Android system. It is also quite easy to do both of these things.